Rebellion within ruling Syriza party tests Prime Minister Tsipras’s ability to hold government together. Greece’s Parliament passed austerity measures needed to secure a fresh bailout, but a rebellion within the ruling Syriza party is testing whether Prime Minister Alexis Tsipras can hold his government together as he seeks to complete the deal. The measures, which include steep spending cuts and tax increases, were approved early Thursday by 229 lawmakers in the country’s 300-seat Parliament, many of them opposition lawmakers. Among the 149 lawmakers in Mr. Tsipras’s left-wing Syriza party, 32 voted against the deal—including former finance chief Yanis Varoufakis—and six abstained. To counter the rebellion within his party, the Greek premier is expected to announce a cabinet shake-up on Thursday, according to government officials. 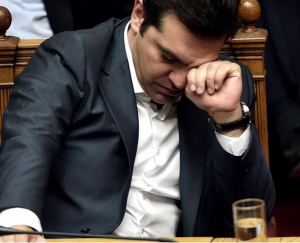 But it remains uncertain how long Mr. Tsipras can continue in office without calling new elections. The vote came hours after the European Commission proposed a fix to Mr. Tsipras’s other immediate challenge: how to pay a €4.2 billion ($4.6 billion) payment due to the European Central Bank on Monday.